Robert Ashley, a distinguished figure in American contemporary music, holds an international reputation for his work in new forms of opera and multi-disciplinary projects. His recorded works are acknowledged classics of language in a musical setting. He pioneered opera-for-television. The operatic works of Robert Ashley are distinctly original in style, and distinctly American in their subject matter and in their use of American language. Fanfare Magazine calls Ashley's Perfect Lives "nothing less than the first American opera...", and The Village Voice comments, "When the 21st Century glances back to see where the future of opera came from, Ashley, like Monteverdi before him, is going to look like a radical new beginning." A prolific composer and writer, Ashley's operas are "so vast in their vision that they are comparable only to Wagner's Ring cycle or Stockhausen's seven-evening Licht cycle. In form and content, in musical, vocal, literary and media technique, they are, however, comparable to nothing else." (The Los Angeles Times). During the 1960s, Ashley organized the ONCE Festival, the annual festival of contemporary performing arts in Ann Arbor which, from 1961 to 1969, presented most of the decade's pioneers of the performing arts. He directed the highly influential ONCE Group, a music-theater ensemble that toured the United States from 1964 to 1969. During these years Ashley developed and produced the first of his mixed-media operas, notably That Morning Thing and In Memoriam...Kit Carson, and he composed the sound tracks for films by George Manupelli. In 1969, Ashley was appointed Director of the Center for Contemporary Music at Mills College (Oakland, California), where he organized the first public-access music and media facility. From 1966 to 1976 he toured throughout the United States and Europe with the Sonic Arts Union, the composers' collective that included David Behrman, Alvin Lucier and Gordon Mumma. With the support of the Rockefeller and Ford Foundations, Ashley produced and directed, Music with Roots in the Aether: video portraits of composers and their music, a 14­hour television opera/documentary about the work and ideas of seven American composers, which premiered at the Festival d'Automne à Paris in 1976 and has since been shown worldwide in over 100 television broadcasts and closed-circuit installations. The Kitchen (New York) commissioned Perfect Lives in 1980, an opera for television in seven half-hour episodes. The opera was co- produced with Great Britain's arts network, Channel Four, in August 1983. First broadcast in Great Britain in April 1984, Perfect Lives has since been seen on television in Austria, Germany, Spain and the United States and has been shown at film and video festivals around the world. It is widely considered to be the pre-cursor of "music-television." Staged versions of the operas Perfect Lives, Atalanta (Acts of God), and the tetralogy, Now Eleanor's Idea, have toured throughout Europe, Asia and the United States. Ashley and his company have been presented at the Avignon Festival, the Festival d'Automne à Paris, Musica Strasbourg, the Almeida Festival (London), the Festival de Otono (Madrid), New Music America (New York, Chicago, Minneapolis, San Francisco, Philadelphia), the Inventionen Festival and the Hebbel Theater (Berlin), by the Gaudeamus Foundation (The Netherlands), the USIS Interlink Festival (Japan), the Next Wave Festival (New York) and Site Santa Fe. The Florida Grand Opera, Miami-Dade Community College and the South Florida Composers Alliance commissioned an opera, based on the experiences of the Cuban "rafters"). Balseros, was premiered at the Colony Theater, Miami Beach, on May 16, 1997. Other commissioned works include operas Now Eleanor's Idea (1993) and Foreign Experiences (1994) for his own opera ensemble, with funds from the Mary Flagler Cary Charitable Trust and Meet the Composer's Lila Wallace-Reader's Digest Commissioning Program; Van Cao's Meditation (1992), for pianist Lois Svard; Outcome Inevitable (1991), for chamber ensemble, by Philadelphia's renowned Relâche Ensemble; Superior Seven (1988), for flute with orchestra and chorus, by Barbara Held and the Bowery Ensemble; eL/Aficionado (1987), opera, by Mutable Music for Thomas Buckner; Atalanta (Acts of God) (1985), by the Museum of Contemporary Art, Chicago, for its anniversary celebration; Odalisque (1984), for orchestra, solo voice and chorus, by The Arch Ensemble, Musical Elements, Alea III, and The Contemporary Chamber Players of the University of Chicago; Music Word Fire (1981), for television, by Channel 13/WNET. Ashley's When Famous Last Words Fail You, for voice and orchestra was commissioned and premiered by the American Composers Orchestra on December 7, 1997. Your Money My Life Good-bye, a radio production for Bayerischer Rundfunk, in English and German, has been completed and will air in early 1999. Dust, an opera commissioned by the Kanagawa Arts Foundation, Yokohama, Japan, premiered on November 15, 1998. 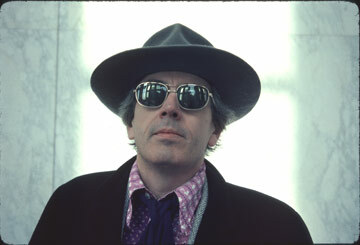 Robert Ashley is the subject of a film by Peter Greenaway, one of a series entitled Four American Composers, Transatlantic Films (London) and Mystic Fire Video (New York). Perfect Lives was published by Burning Books (San Francisco) with Archer Fields (New York), October 1991. Ashley's recorded music and videotapes are available on Lovely Music, Ltd., Nonesuch/Elektra, New World Records, Mainstream, CBS Odyssey, O.O. Discs, Koch International and Einstein Records.